An uncluttered bathroom cabinet or vanity is a beautiful thing, which is why our Style Station Pro is so handy. It can hold a hair dryer, curling iron, flat iron, hairbrushes or other tools - even when they've just been used and are still warm. Plus, the handle folds down for easy storage or if you want to mount it to the wall. You'll also find cord wraps on the back to keep your cords in place. Place it in a cabinet or on a counter, mount it on a wall or hang it from a towel bar. Can this hang from the side of a toilet? There is not a lot of space on the wall and we have NO counter space in our main bathroom and this would work perfectly if I could hang it from the side of the toilet. The piece on the back just goes over a cabinet door so depending on what exactly you are wanting to hang it on. I would not recommend putting on a toilet though for safety reasons. How does the style station pro attach to a wall or cabinet? It hangs over. But, it has to hang outside the cabinet, defeating the purpose of the whole thing. I don't want these things sticking out and hitting me in the knees. I got it because I thought it would go inside the cabinet to hide and store clutter of hairdryers. I can't mount this on the inside of my cabinet, so I wasted my money. I know it says handle folds down and this can be wall mounted , but there are no photos of the backside ,will this sit flat against wall? Yes, in a cabinet or on a counter, mount it on a wall or hang it from a towel bar. When mounted on a wall, the organizer does sit flush to the mounting surface. Can this store over a cabinet door? Yes, it would fit perfect over a standard cabinet door. What are the diameters of each hole? Are they tapered or straight? If they are tapered, then what are the diameters of the narrowest part of the hole? I'd like to place a bottle or two of hairspray and gel, so I need the dimensions of each hole. Our Style Station Pro features a central compartment that is 3&quot; in diameter and two side compartments that are 2-7/8&quot; in diameter. All thee compartments have straight sides. Can the Style Station Pro Stand on its own when items are in it? Yes, fully loaded, our Style Station Pro can stand by itself on a counter or a cabinet shelf as well as hung from a towel bar or mounted on a wall. 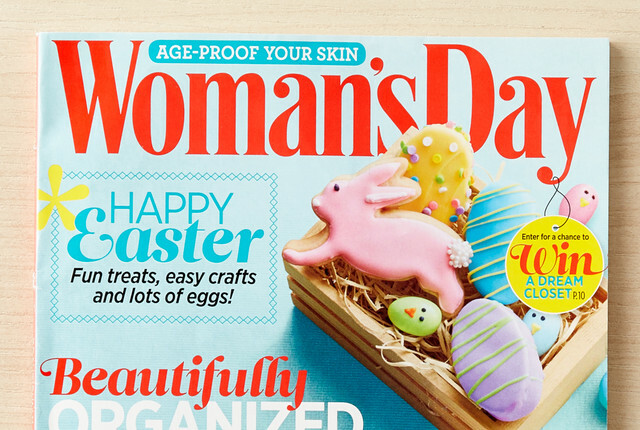 Woman's Day Taps The Container Store for Bathroom Organization Galore!